Is the ordering normal, i.e. m1 < m2 < m3 as for quarks and charged leptons? Or is it inverted, m3 < m1 < m2? The answer to this question will have interesting consequences for model building and neutrino-less double beta decay experiments. Maybe most significantly, it is an integral step towards the discovery of CP violation in neutrino oscillation experiments. 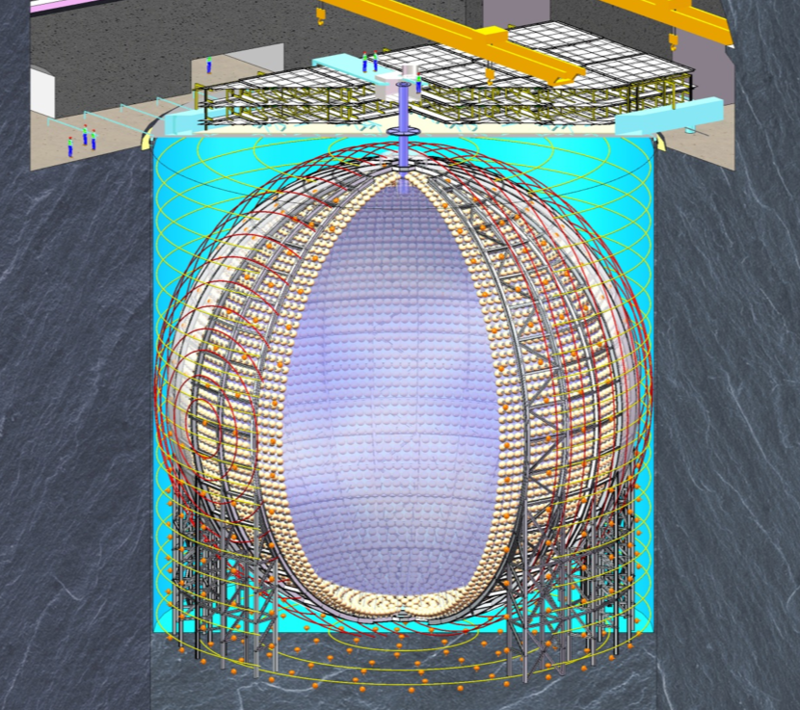 The Jiangmen Underground Neutrino Observatory (JUNO) is but one of several proposed next-generation experiments aiming for a discovery of the mass hierarchy. However, JUNO is unique in its approach to determine the hierarchy by a precise measurement of a subdominant effect (a beat in short-wave oscillation frequencies) in the energy spectrum of reactor antineutrinos. The detector will be located near the city of Jiangmen (so. China) at the optimum oscillation baselines of ~55km from the Yangjiang and Taishan nuclear power stations. Laboratory construction has started in January 2015, while the start of data taking is expected for 2021. Our group is responsible for several detector subsystems at the experimental site in Jiangmen: With the Online Attenuation Monitor and AURORA, we will install two independent systems for measuring the optical transparency of the scintillator, thus monitoring the scintillator quality both during filling and detector operation. For reaching the design sensitivity in JUNO for reactor and solar neutrino observations, it is imperative to achieve the specified radiopurity levels of 10-15 g/g for uranium and thorium in the liquid scintillator. Additionally, potential air leaks in the on-site purification and filling chain risk a re-contamination of the purified scintillator. The Online Scintillator Internal Radioactivity Investigation System (OSIRIS) is being developed as a failsafe monitor to aid the commissioning of the on-site scintillator purification plants and assess the quality of the scintillator batches before filling them into the central detector. 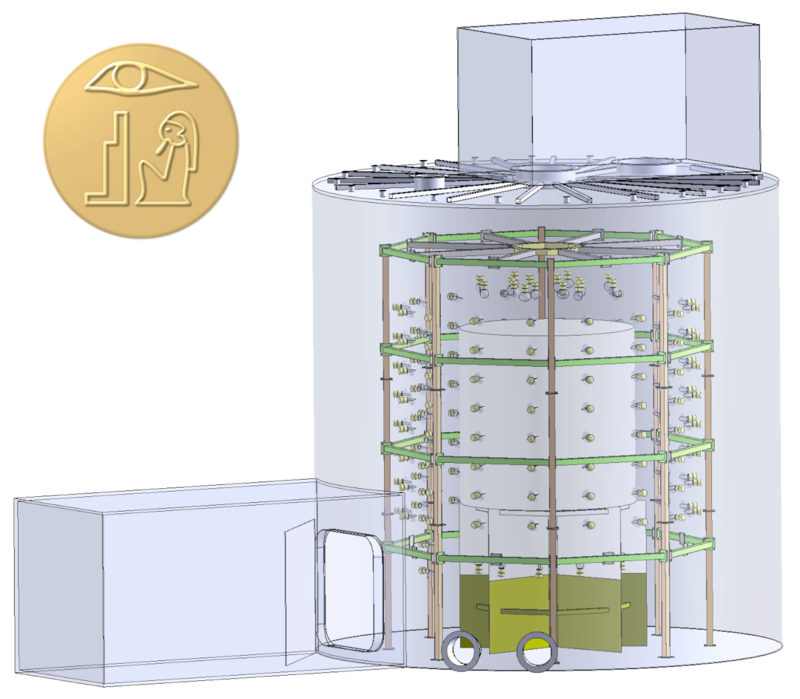 OSIRIS will be a miniature version of JUNO, keeping 20 tons of liquid scintillator within a cylindrical acrylic vessel well-shielded by a surrounding water shield. 100+ photomultiplier tubes will monitor the scintillator and detect light emissions caused by the decay signals of minute concentrations of radioactive contaminants. The Mainz group is leading the design and construction effort of the OSIRIS detector. The OSIRIS pre-detector for radiopurity monitoring.